Christmastime is so rich in tradition, and that alone is one of the reasons why it is one of my favorite times of year. My sister and I have girls that are a little over a year apart, and now that they are a bit more aware of this time of preparation, we planned a cookie decorating party on the feast of St. Nicholas, December 6. In addition to telling the tales of St. Nicholas's generosity, bravery, and leadership (all explained in a short, sweet illustrated video) we gathered to bake and decorate Christmas cookies. My sister Ally is a trained pastry chef, so she had the tools and frosting recipe all ready to go. Our cookies are grain free, nut free, and dairy free, and my sister's recipe was a classic sugar cookie recipe that you will have to ask her for (find her on instagram @amhieronymus). Our girls both love to bake, so they wanted to be involved every step of the way. They each had their own tray with a few cookies, a bowl of icing with a spatula, and sprinkles, of course. I think the best part was dancing along to Bing Crosby and Perry Como while our parents managed the gooey fingers and flying sprinkles. A new tradition for us, for sure. Looking for a Paleo Christmas cookie recipe? YOU GOT IT. WHISK EGGS UNTIL COMPLETELY COMBINED. ADD IN COCONUT FLOUR, VANILLA, CINNAMON, SALT, AND MAPLE SYRUP. USING A SILICONE SPATULA, WORK IN THE PALM SHORTENING UNTIL INCORPORATED. SEEING LUMPS IS NORMAL. ON A LARGE SHEET OF PLASTIC WRAP, LIGHTLY DUST THE EXTRA TBSP OF COCONUT FLOUR TO GIVE THE DOUGH SOMETHING TO STICK TO. SET THE DOUGH ONTO THE PLASTIC WRAP AND LIFT ONE SIDE UP TO COVER IT ABOUT HALFWAY. REPEAT WITH THE OPPOSING SIDE AS IF WRAPPING A GIFT. WITHOUT FOLDING THE LAST 2 SIDES, FLATTEN THE DOUGH INTO A RECTANGLE SHAPE, ABOUT 1/4-1/2 INCH THICKNESS. COVER COMPLETELY AND POP IT IN THE FRIDGE. 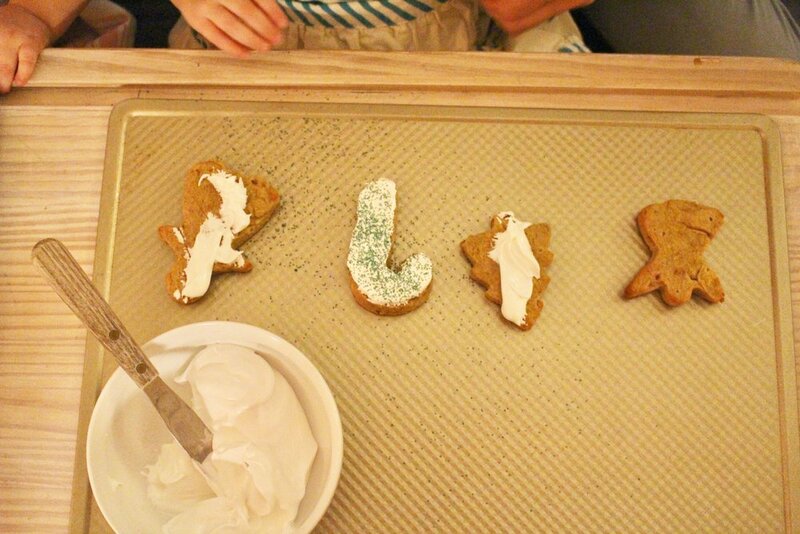 REFRIGERATE THE DOUGH FOR 30-60 MINUTES BEFORE CUTTING OUT COOKIE SHAPES. AFTER DOUGH HAS BEEN REFRIGERATED, UNWRAP THE PLASTIC WRAP. IF YOU SEE ANY CONDENSATION THAT FORMED, OR IF THE DOUGH SEEMS TOO WET, LIGHTLY SPRINKLE MORE COCONUT FLOUR OVER TOP BEFORE CUTTING THE COOKIES. 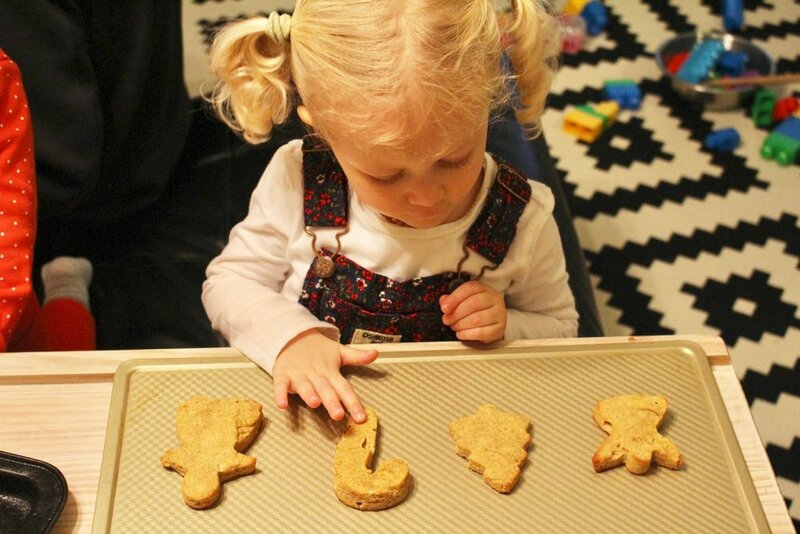 USING ANY OF YOUR FAVORITE COOKIE CUTTERS WITH AN OFFSET SPATULA TO GENTLY REMOVE THE DOUGH FROM THE COOKIE CUTTER AND ONTO EITHER A SILPAT OR PARCHMENT-LINED COOKIE SHEET. POP THEM IN THE OVEN TO BAKE ON 350 DEGREES F FOR ABOUT 12-15 MINUTES.